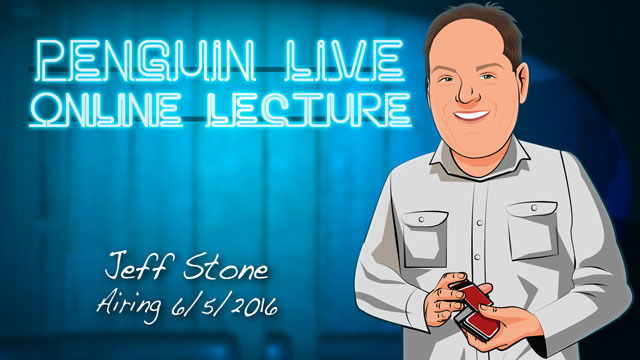 Today, when you order "Jeff Stone LIVE", you'll instantly be emailed a Penguin Magic gift certificate. You can spend it on anything you like at Penguin, just like cash. Just complete your order as normal, and within seconds you'll get an email with your gift certificate. S.S. Vanish A bare handed utility vanish that allows you to vanish just about anything you can fit in your closed fist. This portion of the lecture is my opener and it covers several different applications for the vanish. Visa 2.0 This is mentalism routine that fits into a small card wallet and has a fun presentation where the spectators help you remember what item you recently purchased. Frixion A whole segment on Frixion pen magic. I’ll perform one effect and then discuss/perform multiple ideas/effects possible with the pen. The effect I perform is one where a drawing of a petri dish is shown. It contains “bacteria” from an old deck of cards. When the bacteria is cooked (i.e. a flame is applied to the drawing), the bacteria forms into a selected card. Ace Re-Revisited Portable book test based on (and use with permission) Larry Becker’s dictionary book test. The presentation is centered around the power of the written word. I Need a Hero A stand up mentalism routine involving 6 or 7 people where they take on the role of superheroes and battle it out. The winner is predicted in advance. In a nutshell, Jeff Stone is: Magician, Programmer, Rubik’s Cuber. He became interested in magic as little kid (5 or 6 years old) and has been obsessed with it pretty much his whole life. He spent years as a children's show magician and also spent years performing close-up and stand-up magic. He also served in the U.S. Navy on board a fast attack submarine where he spent countless hours practicing and performing. 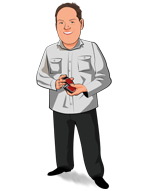 Jeff has a few web clients whose websites (or applications) he's built and maintains. Probably the most notable one is Jay Sankey’s www.InsideDeception.com. He built the site/system and maintains the code along with most of the customer service and tech support. Along with all of that, Jeff has been obsessed with the Rubik’s Cube since he was a kid back in the 80’s. His average solve time is about 33 seconds and his best time is 24.56 seconds! If you've never been to a magic lecture, there's never been a better time. Sunday, June 12th, at 7:00pm, we're streaming Jeff Stone LIVE in a spectacular 2-hour online lecture. Watch and learn things you won't find in any book or DVD. Purchase the Jeff Stone LIVE product. This is your ticket. 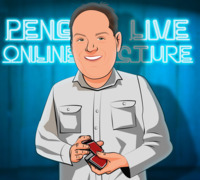 On Sunday, June 12th, anytime before 7:00pm Eastern, click the MyPenguinMagic area at the top of the Penguin site. You'll see the stream appear 1 hour before showtime. At 7pm sharp, Jeff will hit the stage and begin his JAM-PACKED professional lecture. Jeff also has the best youtube magic reviews on the planet. I went to see Jeff Stone live in the studio. His effects are very creative but he is the king of Frixion pen creativity. His lessons on Frixion pens is worth the lecture alone. I also really enjoyed the interview with Dan Harlan at the end and getting Jeff's perspective on being a good performer. Jeff came in and did the stuff that brings him bookings and money. You won't find any "high-end" moves here; no cutting edge cardistry, just good magic well explained. If you watch this and don't find something that will help your act, I will be very surprised. Jeff is a great thinker and his mantra "astonishment over moves" is one that ought to be in the minds of many magicians I have seen. A mixed bag of effects which has something for everybody. Jeff worked hard with an audience of young people who could be difficult at times. Solid performances of very enjoyable and usable effects including cards and mentalism. We'll done Jeff. This was a really fantastic lecture. I loved Jeff's work of on frixion pen (there was so much!) Something that I loved was that Jeff revealed and performed his stand up show which is something we don't get too often and was very welcome. Well worth watching! Heat erase principle was worth the cost of the show. Great mentalism ideas, commercial superhero trick and thumbtip ditch idea and seven card tricks. Jeff shared some of the best, practical insights of almost any lecture Penguin has had. His stuff is useful, usable and unusual - fun and insightful for beginner and professional alike. GREAT LECTURE and worth twice the price!! I really enjoyed this lecture. A ton of really practical stuff for both amateur and pro magicians. I really enjoyed his work with the frixion pen.